Zach Braff took Kickstarter by storm late last month when the Garden State director solicited fans to help fund his indie feature Wish I Was Here. Braff breezed by his $2 million goal in the first few days, but he also found himself at the center of a controversy revolving around big-name celebrities using the crowd-funding service for their own personal projects. At the heart of the debate was the idea that Braff was taking advantage of a tool designed to help relative unknowns fund their dream projects – and while Wish I Was Here is definitely one the actor/filmmaker’s most personal projects (and one the studio system would never officially green-light), the feeling amongst some is that a guy with Braff’s money and connections shouldn’t be turning to the common fan to fund his film. The vitriol got pretty heavy – with some accusing Braff of being a “carpetbagger” and stealing attention and funds from smaller, yet no less worthwhile, projects. Braff is right about this – but I don’t think it’s the idea of his project that people find so bothersome necessarily. The bigger concern seems to be that if projects like Wish I Was Here and Veronica Mars show Hollywood that fans will not only pay for tickets to movies, but the money to make them, Kickstarter is likely to be overrun by big projects that will squeeze out the smaller indie creators. He then addresses the issue that his film is cannibalizing funds from lesser known projects. Braff is right in that we don’t have the analytics, but we suspect what he’s saying is true. High profile projects like this one or Veronica Mars bring in people who don’t frequent Kickstarter (or in some cases, had never heard of the site in the first place). At least a few of those people are likely to look around and maybe drop a few bucks on other things that strike their fancy. One of the other concerns with studios and celebs using the crowd-funding site to launch projects is that it allows creators to raise funds and make projects – which could turn out to be very profitable – without having to reward the investors with anything other than a finished product and some knick-knacks. Braff hopes that will change in the future – and believes there will come a day where Kickstarter backers will earn equity on their investment. “But I do think one day people will be able to get equity in a project like this. They’ll be able to invest in a movie like a stock. It's not legal yet. But there are some very smart people, people a lot smarter than me, figuring out the legalities. And anyone watching this knows that's where it's going. It seems only fair that fans who invest in these projects get a cut of the potential profits, but we can’t even begin to imagine the potential headaches in figuring all of that out. Plus, given Hollywood’s penchant for creative accounting, we suspect most projects wouldn’t result in backers gaining anything at all – but the idea is a nice one. What do you guys think? 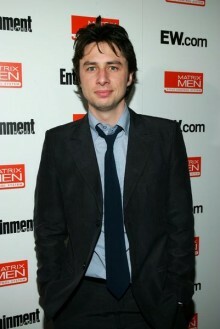 Do you have a problem with stars like Zach Braff funding projects on Kickstarter? If you do, did any of this change your mind? Share with us in the comment section.